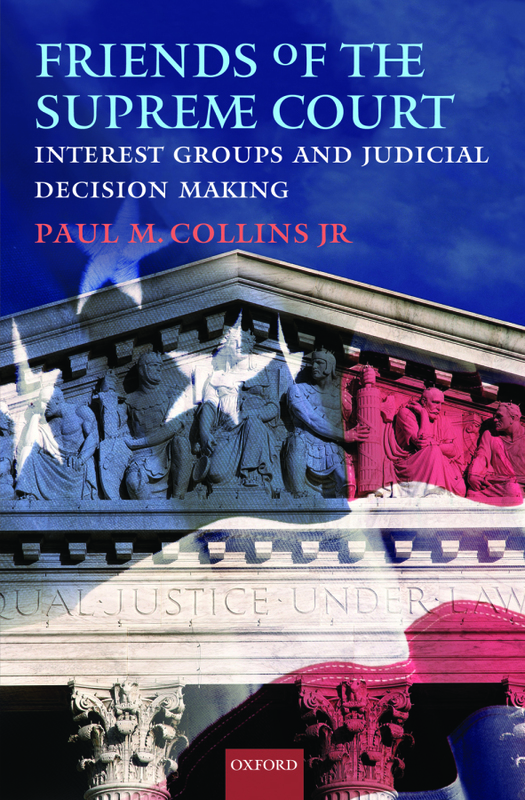 Friends of the Supreme Court: Interest Groups and Judicial Decision Making (Oxford University Press) | Paul M. Collins, Jr.
Friends of the Supreme Court is also available through Oxford Scholarship Online. Friends of the Supreme Court has received the 2009 C. Herman Pritchett Award from the Law and Courts Section of the American Political Science Association. This award recognizes Friends of the Supreme Court as the best book on law and courts written by a political scientist. To read the award citation, click here. —Sara C. Benesh, University of Wisconsin-Milwaukee, coauthor of The Supreme Court in the American Legal System. —Stefanie Ann Lindquist, University of Texas School of Law, coauthor of Judging on a Collegial Court: Influences on Federal Appellate Decision Making. —Harold Spaeth, Michigan State University, coauthor of The Supreme Court and the Attitudinal Model. —Paul Chen, Western Washington University, in Law & Politics Book Review. —Kevin T. McGuire, University of North Carolina, in the Justice System Journal. —Rorie Solberg, Oregon State University, in the Journal of Politics. —Udi Sommer, University at Albany: SUNY, in Law & Society Review. This file contains data and replication materials. The data are in Stata 10 format, compressed in a ZIP file. The Stata code to replicate the models appears in the accompanying do files. To download the data and replication materials, click here: Data and Do File.